No need to worry about seating people all the way around the table. The new arched crossbar leg design eliminates concerns about people's legs bumping into the table. This newer design doesn't compromise the integrity of the table. It provides a contemporary look while still giving a commercial quality experience. Set up your next banquet with ease. Your break-room will love this new addition of a table that doesn't stain with food or grease. Further, this table is light and can be moved around and the round shape encourages employees to get to know each other as each person can talk with others - facing the center. Decorate with beautiful wedding center pieces or decor to fit your church gathering. 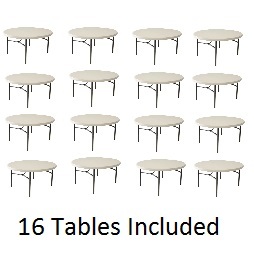 You'll be sure to get years of use without the hassle of replacing tables every year. 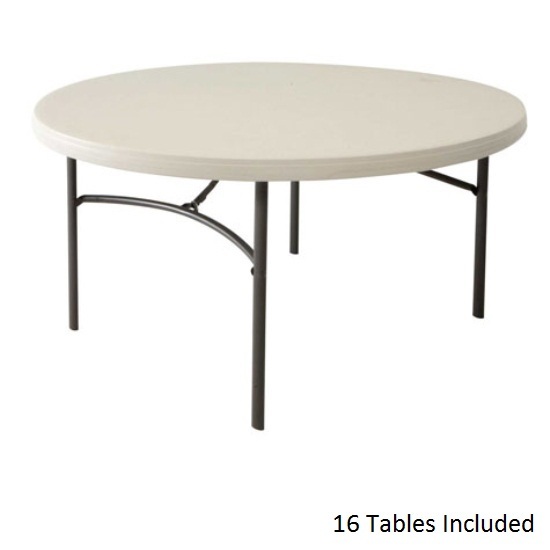 Lifetime Products round folding table model 80121 brings you both strength and convenience with a redesigned leg support. 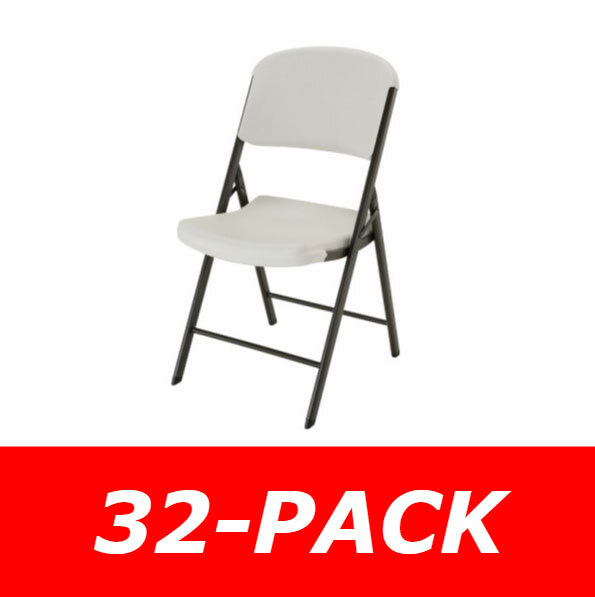 Get the same durable, high-density polyethylene (HDPE) plastic table top and powder-coated steel frame, now with more leg space. 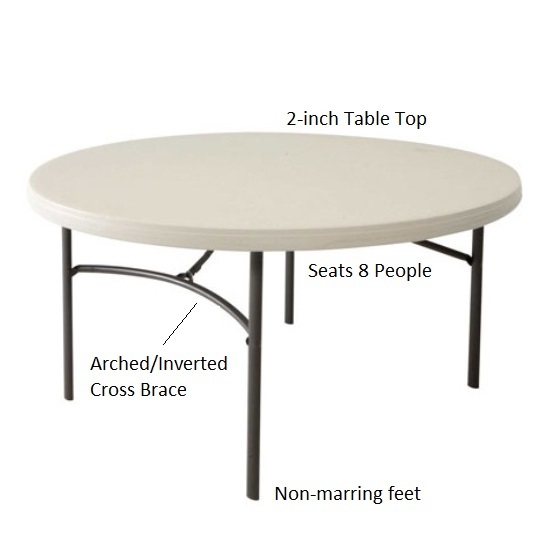 Traditional Lifetime 60 inch round folding table designs have a straight cross-leg support that interferes with leg space. 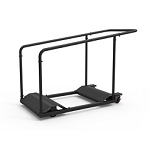 The 80121 features the new leg support from Lifetime Products that is bowed to provide more leg space. HDPE plastic will not fade, crack, or peel like traditional plastics, providing a long life of use both indoors and outdoors. The powder-coated steel frame helps the metal resist rusting. 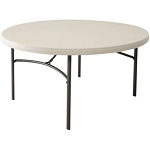 This round folding table comes with a 10-year factory warranty from the manufacturer, Lifetime Products. Material of construction: powder-coated steel. Powder coating steel helps the metal resist rusting. Frame folds up under the table top for easy moving and storage. Overall height when unfolded: 29 inches. Includes a 10-year warranty from Lifetime Products. Folded up dimensions: 60 inches round x 2.25 inches H.
Q: Who honors the warranty for this table? A: Any warranty claims are submitted directly through the manufacturer, Lifetime Products. They can be reached at 1-800-225-3865. Q: Do I need to be present for delivery? A: Yes. Even 1 table is too large of a shipment for a small parcel carrier, such as FedEx or UPS. The table ships on a semi-truck with an LTL carrier. You, or a person you authorize, will need to be present to sign for the shipment and to move the product wherever needed on the property. The driver does not assist with moving the table onto the property. If the truck does not have a lift gate to lower the shipment to the ground, you will need to pull the table(s) off the truck one at a time. This round folding table ships from the warehouse in Clearfield, Utah via an ltl freight carrier for a curbside delivery. This type of delivery requires the customer to be present to sign for the delivery and to move the table wherever needed on the delivery property. The driver will not assist with moving the table on the delivery property. Delivery appointments are scheduled through the freight company. You can wait for the freight company to contact them to schedule the appointment, or you can contact the freight company directly to schedule the appointment once you have received the tracking information via email for the shipment. Dimensions: 64" x 64" x 36"